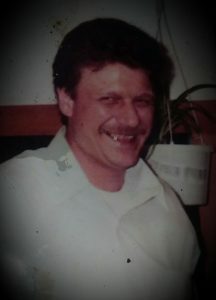 Vincent Pratt, 54, of Ogdensburg, died on February 15, 2018, at his home surrounded by his loving family. Vincent was a generous donation to science. There will be a memorial service on Friday, February 23, 2018 at 2 PM, at the Fresh Start Fellowship Church (50 CR 14, Rensselear Falls), Pastor Reginald Curtis officiating. He is survived by his wife Cindy Pratt, sons, Michael Pratt of Ogdensburg, Justin and his wife Autumn Katura of Ogdensburg, James Middlemiss of Ogdensburg, a daughter Jennifer Austin of Ogdensburg, a brother, Richard Pratt of Morristown, sisters, Deborah and her husband Ed Stevenson of Lisbon, Jamie Barse and Steve “Rookie” Rookey of Lisbon, Donna “Dale” Pratt and husband Brian of Virginia, Sandra Hames and Dave of North Carolina, grandchildren, Paul Austin, Hayden Fifield, Olivia Austin, Trent Katura, Hailey Pratt, Amya Katura several nieces and nephews. He was predeceased by his brother George Pratt. Vincent was born on July 4, 1963, in Ogdensburg, New York, the son of the late George and Christine Bouleris Pratt. He married Cindy Austin, on May 12, 2000 at their home, Judge Fonda officiating. For a time Vincent owned and operated Pratt Taxi in Ogdensburg. Vincent enjoyed, antique picking, the outdoors, hunting, fishing, camping watching movies and television. He loved spending time with his grandchildren. In lieu of flowers contributions can be made to the Fresh Start Fellowship Church Building Fund c/o Pastor Reggie Curtis, 200 Rice Road, DeKalb Junction, New York, 13630. May you rest in peace Vincent. May all the souls of the faithful departed through the mercy of God rest in peace Amen. May you RIP Vincent heaven has gained another angel you’ve got your wings fly high !